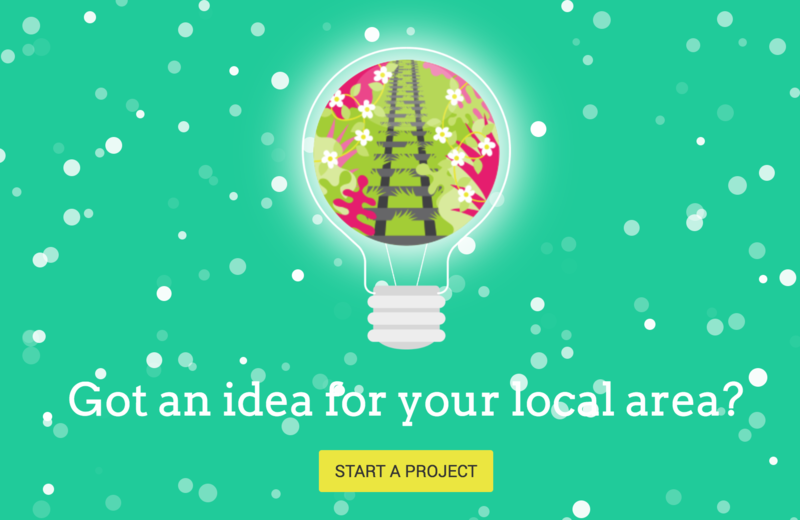 Spacehive is a civic crowdfunding platform based in London. The platform, established in 2012, supports projects aimed at improving local civic and community spaces. Besides collecting donations from individuals, Spacehive also connects initiatives with funding sources including city councils, companies and grant-makers. Furthermore, the organisation and its partners help people with project ideas to build support from a community, make viable plans and create stronger impact. By late 2017, Spacehive funded about 375 projects with an approximate £8 million. What was the need that brought Spacehive to existence and how did it situate itself to existing crowdfunding platforms? The organisation came about in 2012 because the founder and CEO Chris Gourley, a journalist at the time covering planning and architecture within London, saw a real need in the market for something that facilitated a bottom-up transformation, civic participation in urban planning. With this in mind, he set up Spacehive. The very first Spacehive project was the Glyncoch centre in Wales which raised £700,000 out of a £730,000 target. They had six weeks to hit the remainder of their target or they would have lost all the money they raised so far. They thought they had exhausted all their options and were incredibly stressed. At this point Spacehive intervened, offered them help in crowdfunding and introduced them to a couple of big grants to get the community participation going. Glyncoch had the highest unemployment in the UK. People could not afford to pay for this community centre themselves otherwise they would have done it already. Of course it is not about contributions of large amounts of money but about lot of people showing that they are interested by voting with their wallets. They set up the campaign, got everyone involved in the project team to go around door to door, explain the project, get a couple of pounds or whatever people could give and put it in the bucket. With that they were able to go to local businesses and say:”look, a couple of hundred people have all given to something they are really passionate about; if you, as a local business, can also show that you support this, and help fill the needs of the community, they would be very grateful and you will get an amazing return on this of investment.” Once they got the local businesses involved, the next step was to talk to the chains and corporates. They told them “there is a really active community, with businesses and citizens involved, show that you too are also part of this community!” Within six weeks they managed to raise the extra £30,000 mainly from individuals and a number of organisations that came together to make it happen. That was the very first Spacehive project: it showed how people coming together can positively change their space and the community is able control how their resources are being used. How much did this experience condition the modalities of further work? How did it establish the way the organisation started working? The most important part was the proof of concept: for a long time we did not know how to get these different fractions working together. A large part of what we do is working with councils as well as corporates as otherwise they tend to work in isolation. So they would put all their energy resources into making one project and then they would move on. Whereas if they were able to combine their resources, giving everyone an active stake in making the project happen, it would become a more sustainable funding model. This way people feel they have more ownership over what is happening in their communities. So in Glyncoch the most important thing was that all these fractions came together and actually made this project happen. How did you define civic crowdfunding at the time? 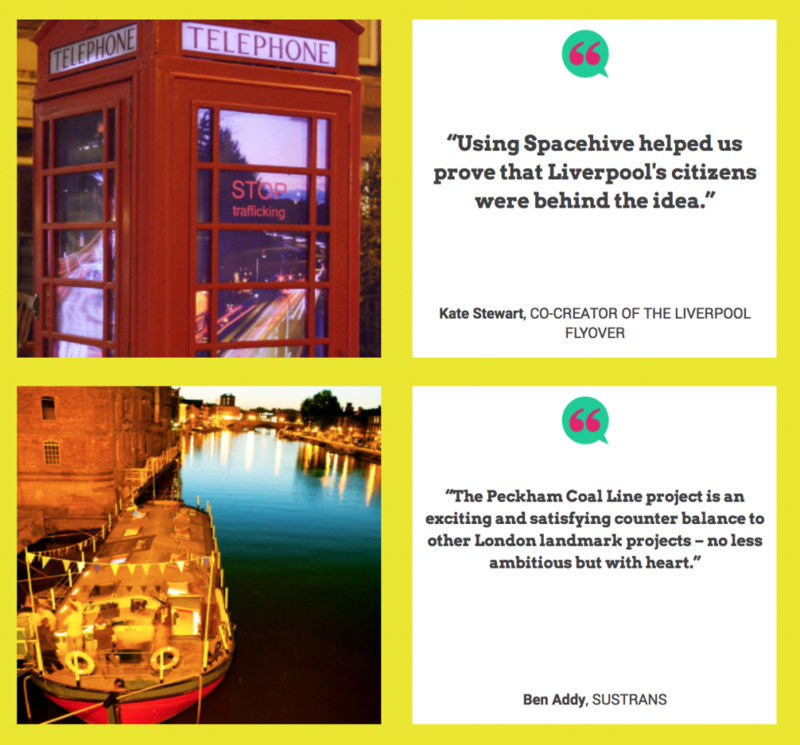 How did you establish the boundaries of where Spacehive would work? The truth is we are constantly refining our definition of civic crowdfunding. It means different things to different people, most often the financing of community or shared spaces. There is a real need for it because crowdfunding had already started working in terms of a kick starter in the consumer space, technology and there was a need to use that technology to change the way people were using money and facilitating change within the public arena. How do you select the projects that you support? What are the selection criteria? We have eligibility guidelines. The most important thing is that the proposed project has to be available for the community to use, it has to be in a public space or have public access. It is any shared space, it can be managed privately or publicly but it has to be open to everybody. Do you check if the applicants’ claims are true? One of the unique features of Spacehive is that we have a verification process from a third party service called Locality. Anyone who uploads a project to our site and wants to pitch at the fundraising stage has to go through this process. It checks whether what the applicants say is true, if they have the appropriate permissions, whether the people or the contractors are already on board. Many of the projects that go for funding on your site are about very expensive processes. How can you help initiatives with match funding or other kinds of support? There are two things there. Buildings are just one part of the projects, we also support live events and any temporary or permanent structures that would transform space. What crowdfunding is often used for is not to pay for the entire renovation of a building but to show proof of interest. It works by building up the money for match funding and show grant makers that there is active interest in the community to make the project happen. Whether it’s a playground or a small part of a greater project, they would crowdfund for that part. Where we come in the project is that we have a whole bunch of partners, grant makers of all shapes and sizes, who are actively looking for projects in their specific areas of interest and so we match them intelligently. So if you came along with a project about creating green spaces and you uploaded it to our website we would then encourage you to pitch that to all the different grant funders who are interested in funding green space. Who are the grant makers and institutions you work with? We work a number of corporate partners, councils and grant funders, for instance, the Esme Fairbarn Foundation, one of the UK’s biggest grant funding bodies but we also work with businesses such as Barclays and their Lifeskills programme. They specifically fund programmes with young creators, ages 16 to 25 and they actively promote the skills you build from actually crowdfunding a project. We also work with the Hyde Group, a property developer looking to build up community cohesion. By using Spacehive they are able to give their residents a platform where they can share their ideas, engage their community and build up a cohesion and neighbourly spirit which is often lacking in big cities like London. All these different organisations use Spacehive in different ways but ultimately their power is that by building up these ecosystems of different partners the projects get funded much faster with a much wider group of stakeholders. When it comes to municipalities, there are building regulations, planning codes, long term development strategies: how do you make sure that the project you support comply with these frameworks? All projects have to upload their planning permissions in advance. The great thing about working with the different councils is that if there is a project that is interested in a certain space and they are looking to engage the council, this is a great way of building up their relationship by putting a project in the site as an idea, building up support and use that as an activist route to get the council involved at an early stage. What are the rewards you offer to the people who donate to the campaigns? With civic crowdfunding the reward is the project itself. You can say most of the funders are quite ‘selfish’ in that they put money in the projects because they want to enjoy it or they want others to enjoy it. The projects might also offer additional rewards, but generally it is not what motivates people to get involved. Community cafés might offer food or drinks, they might invite you to a party to celebrate successes, or in other projects they might write your name on a part of the pledging wall but ultimately people pledge because they want to be part of something. We do not promote equity-based crowdfunding. In terms of rewards it is on a project by project basis but generally the project itself is the reward. There was a debate a few years ago around Brickstarter. Some people said “we are already paying tax, why should we also contribute our own money towards the public good?” How do you see your role in relation with the public sector? I think it is a complimentary role.The joy of the crowdfunding model is that if people see something and they want to pay, they can, and if they don’t want to pay they don’t have to. What the crowdfunding aspect does is that it allows people to vote with their wallets for what they want to see in their area so it is not replacing what the council services and what the government taxes are paying for. Demand is increasing and budgets are decreasing in the government sector so this is a way to actively say how they want to prioritise government spending and get a whole bunch of other partners involved. Where do you see the field of civic crowdfunding evolving in five or ten years? What are the limitations of civic crowdfunding in shaping the city? The boundaries are unlimited, you can do anything with civic crowdfunding. It is growing in terms of the public’s recognition of how different people in different places engage. But crowdfunding is not going to replace planning. You will still need investors, but crowdfunding plays a part by getting people to have a say and creating that bottom-up democratisation of choosing what is important and how you want your city to grow. Actually we were listed with the GLA (Greater London Authority) as one of the top ten world innovations in government earlier this year and it is really interesting to see the other projects, to see what other countries are focusing on in terms of how government is engaging with a community. That is so powerful, getting citizens, getting councils and businesses into the same platform and talking about what they want to see happen. How do you think the civic crowdfunding models can compete with very large speculative investment that is dominating cities especially London? Do you see this creating more spatial justice in terms of property development or at least the development of public spaces? What people really like about the model is transparency: that they can see all the different partners. It means there is some kind of ownership and responsibility during the project delivery. On the other side, it puts the onus of responsibility on the project developer and project delivery manager to answer back to all the people who funded it. It is very empowering and that is what we are looking to do. To empower citizens to take control and play an active part in the areas where they live and civic crowdfunding allows them to do that. Economy, London , commons, community, crowdfunding, economy, English, finance, municipality, participation, renovation.